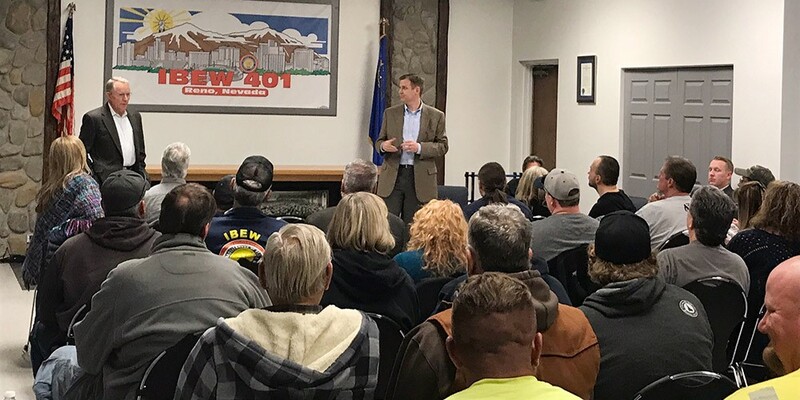 In mid-March, NV Energy CEO Paul Caudill and President Doug Cannon participated in an open forum discussion with IBEW 1245 members and retirees at the Local 401 hall in Reno. The Q&A focused largely on Question 3, a statewide initiative which seeks to deregulate the energy market in Nevada. The misleading constitutional amendment, which was already approved by Nevada voters in 2016, will be on the Nevada ballot again this November, as the state requires constitutional law changes to be approved twice before they can go into effect. For more on Question 3, click here. During the Q&A with NV Energy execs, Local 1245 members and retirees inquired about the possible repercussions that could result if Question 3 is passed, including the loss of jobs, increases to the cost of electricity in Nevada, and the effect that those cost increases would have on retirees. Caudill responded to the questions thoughtfully, and also thanked IBEW 1245 for the a recent letter of agreement that allows members working in generation to help in substations and telecom, which, according to Caudill, will lead to cost savings.